In India, we learned there’s a gigantic difference between the well-worn tourist path and independent exploration. If you follow a guidebook, you can easily become trapped by a world of chore-like sightseeing tours. Bus → Queue → Pay → Look → Leave = Boring! From our 5 months there, and talking to various travelers, here is our Bucket List for must-see places of exploring India. Foreign departments in most countries advise tourists NOT to visit border regions with Pakistan due to terrorism risks. But if you read the fine print, they usually exclude Ladakh and Wagah (which are both in the North amongst ongoing conflict) from their warning. Ladakh is a high-altitude outpost in the far North of India. At certain times of the year you can drive, but otherwise, snow covers the pass and air is your only option. Most people who visit Ladakh describe it as a Mountain Shangri-La. Its remoteness has fossilized an ancient way of life, which is otherwise unknown in greater India. Wagah is on the border of India and Pakistan. It’s home to the famous Border Crossing where the most elite soldiers (from both sides) ceremoniously battle by way of marching. The soldiers tower above you at a minimum height of 6 foot 8 inches. With extravagant shoes and hats, they’re closer to 10 feet tall. It’s a great spectacle, especially the thunderous Goose Stepping. Hampi is a village in Northern Karnataka, which is the state that Bangalore calls home. However, Hampi is geographically much closer to Goa than Bangalore. We expected to land amongst tea plantations, but the reality of Darjeeling is it’s a popular tourist destination with very little interaction with the surrounding tea industry. Sure there are tea retailers, but there are few excursions or activities amongst the plantations. Instead, we found beauty in the high-altitude surroundings, the fresh air, the nearby Himalayan Mountaineering Institute, the zoo, the night markets, the views of Mt Everest in the morning, and the chance to take a break from otherwise chaotic India. Bombay is unlike the rest of India, but not in the way you may think. Sure it’s more developed than most Indian cities, but it doesn’t have that overrun feeling. I know that sounds contrary to India as a whole, but at least it was our experience. From the old black & yellow taxis to the vast colonial buildings, Bombay certainly retains more English influence than anywhere else in India. In fact, I’d go as far to say Bombay has some serious charm. Even the touristy areas down near Colaba and Churchgate are bearable because they make up such a small portion of the city. You can visit the famous Leopold’s Cafe, take a trip to Elephant Island, cruise around the Gateway of India, walk through the grand Taj hotel, visit the markets, and do so many otherwise bland things that are made interesting from their Bombay setting. Pushkar is one of the only seriously touristy places we’d suggest visiting and that’s because of its Camel Fair. This is a festival where buyers and sellers come from far and wide to trade not only camels but horses and other goods too. It’s a photographers delight with a contrast of colors that makes it difficult to take a bad photo. For everyone else, the atmosphere is more than enough to make a visit worthwhile. Keep in mind that Pushkar is a holy city. That means no meat, no liquor and a focus on local traditions, such as wearing long clothes, even for men. Quite simply, Varanasi in India. It’s one of the oldest continuously inhabited cities in the world, and it encompasses the very best and worst India has to offer. 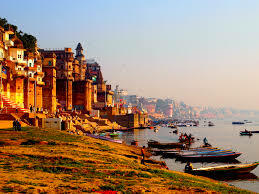 The centerpiece of Varanasi is the holy Ganges River. This is where locals perform devotions to the river and also where, as numerous stories recount, you’ll see the odd body floating face down. No visit to India is complete without the experience of Varanasi. Indian trains aren’t exactly a place to go, but rather the recommended way to get there. The berths are comfortable and the ride is an adventure in itself. The lower the class you travel in, the more you’ll be taken care of by locals. In the first class, you don’t get much interaction as you’re confined to your own cabin. In second class (air-conditioned), the berths are all open, but with fewer people crammed into each. Then in sleeper class (effectively third class), you really start to get friendly with locals, whether you choose to or not. As you hop off at random stations for a quick chai and bite to eat, you really get a feel for how diverse and colorful India really is. And if you don’t eat often, expect locals to offer you meals five times a day, because if you look even remotely slim, they’ll assume you’re starving.